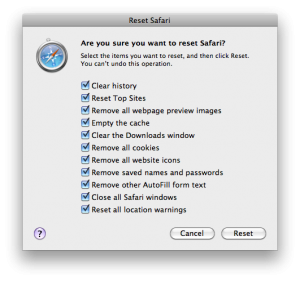 How to Delete all the Private data in Safari browser? Safari browser, like any other browser stores all the information about web pages you are viewing, manages a history, saves cookies, saves website icons, autofill form text, and the downloads information. Apart from that, if you wish to save your usernames and passwords in websites, Safari does that too. But there are situation when you would be wanting to delete all the data from the browser, and most importantly the private data. Open Safari browser, and click on the Safari menu, right next to the Apple icon in the left top section of the screen. 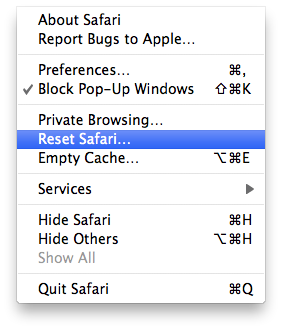 Hit “Reset Safari…” option. I am an avid Apple product fan however I have not got used to the safari web browser yet, I am mostly a Chrome fan. I am using safari from some time. It is good. I’ve done that. But still the the top hit shows the sites I’ve visited. I even uninstalled the software and downloaded a new one. Still whenever I type the first letter of the website in the address bar, it will show in top hit the site that I’ve been wanting to get rid of. What should I do?